One of 2018’s best – MISSION: IMPOSSIBLE – FALLOUT – stuns and wildly entertains us with its non-stop action twisty plot and stellar 4K/Blu-ray release. It’s clear that Actor Tom Cruise isn’t showing signs of slowing down. Now 56, Cruise continues to demonstrate that he’s more than willing to continue holding the mantle of Best Action Star, fractured ankle aside. His summer blockbuster – MISSION: IMPOSSIBLE – FALLOUT – was a total success at the box office and reminds us of the awesome power which the Summer movie used to command. It’s a winner from start to finish, a whirlwind of explosions, high stunts, and smart writing that could see a couple of spin-offs if they’re not careful. The 4K/Blu-ray could be the best release of the year, with excellent video and audio, along with an impressive collection of extras. 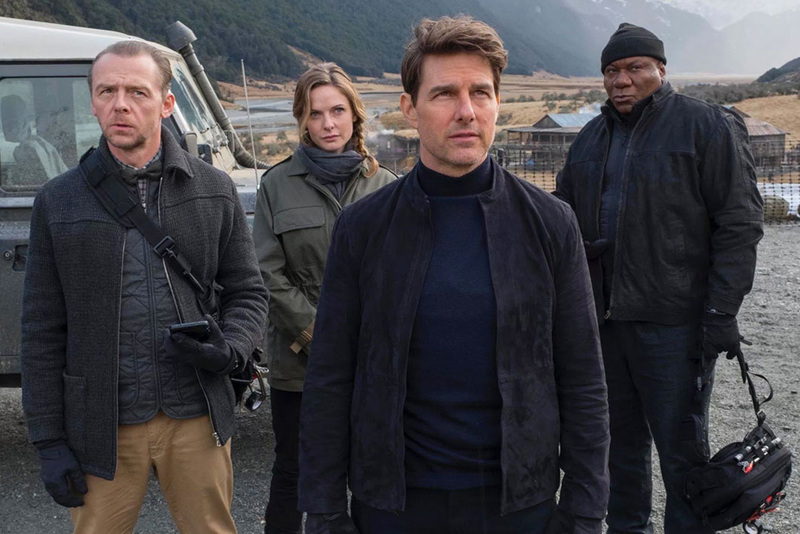 Ethan Hunt (Cruise) and his Impossible Mission Force have dealt The Syndicate a crushing blow in recent years, wrapping up assets around the world since the capture of boss Soloman Lane (Sean Harris). Unfortunately, a deal to secure three plutonium cores goes awry, leaving their location in the wind. Saddled with the CIA “observer” Walker (Henry Cavill), Hunt attempts to re-secure the plutonium via the mysterious broker White Widow (Vanessa Kirby), but soon comes face to face with his old ally Ilsa Faust (Rebecca Ferguson). She is hunting the whereabouts of Lane, who has been shepherded from country to country to answer for his crimes. But soon, Hunt is forced to realize that he might need Lane if he is to secure the cores. What he doesn’t know is that Lane is again one step ahead of him, having both inserted a Syndicate agent within the US government and pinning several crimes on Hunt. Forced to once again go rogue, Hunt, Benji (Simon Pegg) and Luther (Ving Raymes) must locate the cores before they’re detonated, while staying one step ahead of the CIA, the IMF, and Lane’s men. MISSION: IMPOSSIBLE has now solidified itself as the best spy action franchise (sorry, James Bond) for several reasons. The return of Director Christopher McQuarrie would by itself be a reason to purchase FALLOUT, as he struts his amazing technical prowess, gifting us with some of the best action sequences of the year. FALLOUT clearly is set on the stilts of high action, moving from one bike chase to a shootout to a bathroom beatdown that is even better in the stunning home release. FALLOUT is also a very good thriller, complete with deceits, blind alleys, and the requisite use of masks that’s one of the franchise’s lighter elements. We get references to older films in the franchise, as the return of one specific character is both fun but also bittersweet. By the time Hunt is through, he’s paid a high price for his heroism, including one shocking death that in some ways wasn’t necessary and the departure of another character that seems about two movies too late. But all of that is forgivable considering what we get in return. FALLOUT isn’t really concerned with being as smart and gorgeous as ROGUE NATION (that one is perhaps my favorite); but FALLOUT doesn’t need the previous films to be great. It’s much more of a visceral action experience, cobbled together with that deception which has made the series so entertaining. You need story when the action stops, and Writer McQuarrie does just enough to fill in the blanks, considering that he and Cruise wrote most of it on the fly. Hunley (Alec Baldwin) enjoys a bit more play here, even going so far as to declare one of those “I can see why you love this job so much” lines. Faust is hunting Lane because (for some reason) MI6 won’t let her back in unless she delivers the terrorist. I wish there had been slightly more plot development for her, as she was the breath of fresh air that in many ways pressed ROGUE NATION to my top film of 2015. Here, she moves in perfect sync with Cruise, once again enjoying great chemistry and looking quite dashing as she roughs up the competition with those signature climbing moves. She’s a real badass here and definitely deserves her own spinoff. Speaking of beauty in need of a spinoff, Vanessa Kirby’s White Widow surprised everyone: she’s gorgeous to look at, but her role as broker to the spies pays off immediately as she winds her way through the IMF’s mission. Imagine an MI6 series with Ferguson pursuing a terrorist and needing Kirby to assist her. Add a little Pegg and Raynes with Cruise delivering a perfectly-placed cameo, and Paramount can make $100m White Widow movie to the bank. I’ll take my cut now. But no M:I movie would be complete without the insanity of Cruise’s high-flying stunts. He clearly doesn’t care how difficult – or dangerous – it appears; he’ll try it as many times as needed (see his fractured ankle that delayed filming for a few months). His dedication is without equal, making him the top action film star for a reason. The brutality of FALLOUT’s action pieces – which include him falling from a helicopter, Halo skydiving, and climbing a mountain ridge – were really shot without the use of stunt doubles. Of course, no studio is going to allow this without assurances, but Cruise seems unfazed; he’s clearly enjoying himself running and riding through Paris. He’s also given a chance to wrap up an ongoing story that ends in FALLOUT. I do think it’s handled well enough, paving the way for something that will probably work better as this franchise speeds on. There’s continually a sense that McQuarrie’s 147-minute behemoth has a lot more gas in its tank, knowing the exact time to power up the action to deliver “oh!s” and “wow!s” from the audience. And yet, listening to the commentaries it’s clear that FALLOUT was shot quickly in parts and sometimes without a clear idea of where its characters would go. The fact that the film succeeded so completely is a testament to the long-standing personal relationship of McQuarrie and Cruise. I’m not sure how many more times the duo can capture lightning in a bottle, but it’s great to see it work so completely here. If you’re still one of those people who have trouble equating Cruise’s thoroughly entertaining films (I love the underrated OBLIVION and AMERICAN MADE) with past behaviors, I hope you will finally drop it. Sure, the guy’s a weirdo in real life, his continued membership in Scientology bordering on a cult, but you can’t argue that he owns his work like few do. His willingness to risk life and limb is equaled in FALLOUT with some of the most emotional scenes of the series, as he’s forced to realize that his good intentions to protect family and friends might result in losing everything. That’s no mere hyperbole, as McQuarrie gives Hunt plenty to do and think about, while Lane moves all the chess pieces towards a final deadly encounter. His relationship with Walker, a physical brute as played out in the trailers, is Hunt’s most impressive physical adversary of the franchise. If you’re going to doubt someone, you might consider whether Cavill can ever make a movie that audiences will love. He looks great but delivering lines has never been his thing. It was the only real doubt raised as audiences reveled in delivering the movie a $790m worldwide haul. It is quite simply McQuarrie’s madness reborn, and given its success we’re sure to get a few more before Cruise walks away. It’s unclear where Team Cruise can go in future installments, unless a trip to actual space is in the works. Heaven help us. Paramount presents MISSION: IMPOSSIBLE – FALLOUT in an HEVC format and is the first in the series to feature Dolby Vision and HDR10. The result is a great transfer even if some might claim that the image looks muddy; the reality is McQuarrie’s vision favors wider and longer spaces and he loves using the available light to blur the scene. Colors are well balanced and skin tones look realistic, which is essential in projecting the kind of mayhem that McQuarrie and Cruise are seeking. Cinematographer Rob Hardy uses the environment to up the tension, which does lead to some “JJ-ing” with light noise prevalent, but none of it detracts from the film. Sharpness, especially in Dolby Vision, is stunning especially as you process the IMAX action scenes. I disagree with some critics who claim the fierce lighting – particularly during the bathroom fight scene – aren’t detailed enough. Everything carried through on my platform quite well. That version is slightly brighter, which I might assume looks even more bright on a smaller screen. Please let us know if you notice. Shadows in the film are so pervasive to begin with that all could have gotten lost in a sea of murkiness. Luckily Hardy (cinematography) and Paramount (transfer) minimize this to make the film’s technical merits even stronger. Blu-ray fans will also appreciate their experience, although 4K and Dolby Vision have really made a great case in the past year to consider the upgrade. There are so many different cameras used – mostly Arri and Panavision – but each works quite well to bring the story into focus. Finally, with no pixelation or aliasing, it’s a great transfer considering the harsh look which Hardy and McQuarrie produce, but which serves the movie well. For those of you with a Dolby Atmos kit, you’ll really like the immersive audio experience which pours out of the speakers. But even if you still favor the “good enough” of 1080p and Dolby 7.1 TrueHD, you’ll still enjoy the expansive and wonderfully balanced elements. Power pours from the speakers regardless of your set up, excelling both quiet moments and the more pulverizing ones. Center dialogue is prioritized and easy to hear, while forward speakers do their part to move motorcycles, cars, or Composer Lorne Balfe’s incredible score from left to right or play as an ensemble. The rears are where the Atmos/TrueHD shine, showing off crowd noise, the sound of running water in the bathroom scene, or in general background chatter. The LFE hits hard in dance beats, explosions, collisions, and in Balfe’s marching drums. No matter the platform (I even think this would sound great on a soundbar), you should fully enjoy what’s become an audio experience from this franchise. Audio Commentary by Director Christopher McQuarrie and Actor Tom Cruise. Audio Commentary by Director Christopher McQuarrie and Editor Eddie Hamilton. Audio Commentary by Composer Lorne Balfe. Isolated Score Track: This is a particular treat, as we gifted Balfe’s incredible music without dialogue or sound effects included. This would garner any release at least two stars by itself, although it’s only presented in Dolby Digital 5.1. Light the Fuse (11:10): This is a 30,000 foot discussion of the plot, including Tom Cruise’s injury during filming that stopped production for several months, as well as the incredible IMAX photography process. Top of the World (10:48): Once again, it’s the Tom Cruise Show as we learn just how difficult it is to Halo and shoot a movie. Who would have thought? Rendezvous in Paris (7:21): Paris is front and center here, showcasing all the beautiful locations around the city. We also learn about the dangerous car chases and how Cruise orchestrated all of them without a stunt man. The Fall (5:57): One of the most dangerous (and perhaps least appreciated) stunts of the film, this featurette focuses on the choreographed fall by Cruise during the third act. The Hunt Is On (11:08): A well-made discussion of the helicopter chase sequence, including the dangers, Cruise’s training (it’s actually him in those spinning scenes), the beauty of New Zealand, and meshing all of that into a believable sequence. Cliffside Clash (4:02): We learn about the brutal fight sequence between Cruise and Cavill. Deleted Scenes Montage (3:41): Perhaps the most interesting of all the supplements, we are granted a “What If?” series of deleted moments with optional commentary with Director Christopher McQuarrie and Editor Eddie Hamilton. Included here is a portion of the sequence from the first trailer. Foot Chase Musical Breakdown (4:50): A total highlight of FALLOUT, Composer Lorne Balfe takes us through a unique featurette. Normally, a composer spotlight merely features scenes of the orchestra and composer: walks audience through, and allows the audience to listen to, the individual musical components that work together to create the music for one of the film’s action scenes. The Ultimate Mission (2:51): In what feels like a soft goodbye to the series, Cruise reflects on his devotion for the franchise, the various challenges in making the movies, how practical stunts pay off, and how McQuarrie has upped the series since he’s taken over. Storyboards: This is a series of hand-drawn storyboards for several scenes that are accessed with your remote control. Theatrical Trailer (2:33): I love the piano at the beginning and wish McQuarrie could have found a home for it in the film itself. Our evaluation copy arrived as a 4K/Blu-ray/Digital Copy. 4K slipcases have evolved since their inception, and this one is most like Blu-ray slipcases. It’s embossed and colorful, and while there’s no interior artwork, we are presented with a very nice glossy minibook titled Stunts: Raiding the Bar. It contains quotes from the team focusing on several key sequences like the Halo jump. There is also a very special version from Best Buy, a steelbook which includes interior artwork and glossy mini-book. Overall, it’s the best release of 2018. MISSION: IMPOSSIBLE – FALLOUT is a wildly-entertaining movie and honestly deserved much more than its $790m worldwide haul (currently 5th). Cruise more than delivers the best action set pieces of the year, propelling the film through the various plot twists that have made this franchise a go-to. There’s even the possibility of two spinoffs that I’m sure Team Cruise might not have considered, but it’s certainly in play now. Cruise and McQuarrie are nearing their zenith in terms of big-budget action, so perhaps a smaller thriller with Ferguson is a possibility. But until then, enjoy the best home release of 2018, complete with three commentaries and over an hour of other supplements. It’s a gold standard that James Bond films will be hard pressed to match; celebrate that and leave any doubts about Cruise’s lifestyle at home. You’ll love the results. MISSION: IMPOSSIBLE – FALLOUT is rated PG-13 and has runtime of 147 minutes. Matt Cummings reviews - and loves - MISSION: IMPOSSIBLE - FALLOUT.